Türkçe versiyonunu okumak için tıklayın: İnsanları Gezegenler mi Yönetiyor? However, according to many astrologers, the planets don’t rule us. Otherwise, should we have Muslim, Christian etc. astrologers? A presupposition like this, for those believers in these religions, for example for Muslim astrologers, is nothing but blasphemy against god. But we know that many Islamic scholars were also astrologers. On the other hand, for the majority of the astrologers of old and for a few astrologers (pagan) of our day, each celestial body is a reflection of a god and they represent their wills. 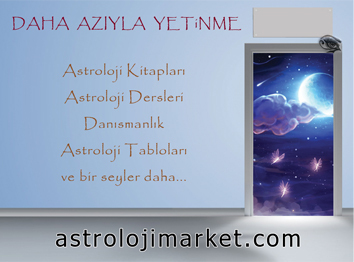 According to astrologers who think like that, that is why astrology is the “language of the gods”. So, for those astrologers who don’t believe that the planets don’t rule us, how does this system goes? Actually, while writing those phrases above, I wanted to tell about the quality of the synchronization of the up and low. If Mars represents athletes, and it’s getting bad angle in the skies, we think that the athletes are getting a bad angle here. Synchronization expresses that the fragmented systems which work in cooperation have their timings matched. One of the three great founders of the depth psychology, also the founder of the analytic psychology, Carl Gustav Jung brought the synchronicity to a whole life. Previously, I told about our story of renting the place of the Astrology Academy, somewhere. In this article, I’ll give another example: Every Saturday, I go to Istanbul from Izmir to give lessons. In 13 April 2013, as I stepped in Istanbul, the commotion around me was the Chinese. While I was going to the office, a Chinese couple passed before me. Hours later, while I was looking out of the window, I saw a Chinese running. And during the evening, I went to my Aunt. We were going to make a girls party. My Aunt told me she cooked Chinese. Normally, everyone will experience synchronization like the example above every day. But, this synchronization couldn’t be noticed because of the lack of knowledge on astrological symbolism. Chinese bombardment is a fractal that can be noticed without knowing about astrology. But not all fractals are like this. You’ve met a person with a political life in your daily life. You got some money from somewhere. Your boyfriend send you flowers. You wanted to listen to music more than you normally do, it was day you were lazy. Your cat entertained you much. You ate dessert more than enough. For those who don’t know astrology, the events above are not linked at all and seems totally “normal”. For an astrologer, everything above is a Venus symbol and there is an obvious synchronization..
I’ve told how the system works for those who don’t believe that the planets are gods. In this system, there is no factor of “god or gods”. As the M-theories shows us, there are connections, etc. But, of course, I’m not saying anything against those who see them as the hand of god or the will of the gods. Saying what to believe and attacking a belief is moral dictatorship. As it is normal for an atheist to know Quran, as it is normal for a Muslim to have read the God Delusion of Dawkins, knowing about different points of view is normal.